Remingtons Sports Bar - Home of the Tulsa Packer Backers! The best place to watch the game! Come join us and have some great food! Remingtons Sports Bar is Home of the Tulsa Packer Backers. 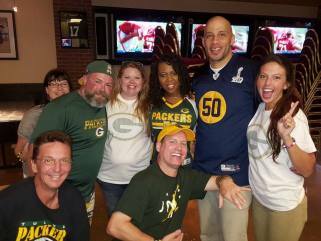 Join us during football season for the ultimate Green Bay Packer watch parties. Remingtons also offers daily happy hour with 1/2 price all food items and $5 domestic drafts and bottles from 5 to 7pm everyday. We are located in the Southern Hills Marriott at 71st and Lewis in South Tulsa. Weekly specials include Rib Rockin’ Tuesday’s & Cinco de Wednesday’s. We also have karaoke in the bar every Friday and Saturday nights. Join us for dinner, drinks and great conversation at the bar. Casual lounge seating available too. Great place if you’re a Packers fan. Enjoy coming here on Sunday for the Tulsa Packer Backers. Also, just a great place to relax when the Packers aren’t playing. Wonderful and friendly service!